As my husband and I are settling into the basement of our new home, I've noticed many things that I have taken for granted. You see, the first home I purchased in back in 2005 was a spec home which was nice and new and didn't need a bit of work besides seeding a lawn, installing window treatments, and moving in furniture. It has been a great home, and I'm glad that my brother and his soon-to-be wife will be purchasing it. From a sentimental perspective, many great memories come from a person's "first" home, and I hope they have those same memories to share with their new family. 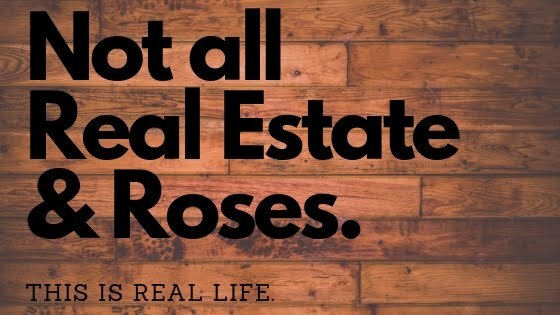 From an ownership perspective, I know that they will take great care of it, and I won't have to worry about driving by someday to see that the yard is overgrown or it is in a state of disrepair. No homeowner wants to see their first home go that route. 1. A toilet paper holder and towel bar in the bathroom. I've heard many people complain time and again about their kids or spouse leaving their wet towels on the floor. What's even more annoying is when you have no other option and you have to use a vacant door knob or the back of a chair in the living room to hang up the towels. Nothing says, "Come on in and have a seat" like a damp bath towel soaking through your shirt. 2. A microwave. An electric skillet (a big shout out to the person who gave us that for a wedding present) will have to do until we have one installed. I learned how to warm up some leftover mashed potatoes along side some Hamburger Helper last night. The trick is to make a sturdy dam out of hamburger to keep the items separated in the pan. 3. A dishwasher. Right now, a one-basin metal sink with a broken strainer is keeping the paper plate companies in business. My new motto is, "Wash fast or don't wash at all!" 4. A washer and dryer. Has anybody ever wondered why a place that is designed for cleaning clothes can be so dirty? Nothing like trucking all of your personal items to a laundromat where you pick the only washing machine that doesn't spin out and the dryer that doesn't heat. Plus, everything came out smelling like a smoky bar. Again, hanging all of the Tim's jeans and t-shirts around the lower level of our home has created a welcoming atmosphere for guests. 5. Garage door remotes. An attached garage is wonderful, but if you have to get out of the car to make the door open and close, it really defeats the purpose (especially when the door doesn't go up all the way, so you have to stand on your tippy toes to give it that little extra nudge so you don't give the top of your truck a close shave.) The seller told us the remotes were in the house "somewhere," and we're still holding out hope that we will find them. We still have a couple of walls on the main floor that we haven't pulled the plaster off of. I'm sure that's where they left them. 6. Keys. At least the one we have came with a big smiley face key ring holder that politely says, "Have a Nice Day!" It might sound like I'm complaining, but I'm really just trying to share the humorous side of home ownership. If somedays it feels like you have taken a step back in time, you probably have. Don't worry, the "honey-do" list will eventually get completed. This weekend will be filled with the excitement of installing towel rods, toilet paper holders, and door knobs! Just remember to appreciate the little things in life. Welcome Home! Many things have changed since my post last week. My husband, Tim, and I are the proud new owners of a home in Wisner, Nebraska as of December 30, 2011. We finally have a place to call "ours" rather than "yours" or "mine." It even came with a tower which rivals the tallest building in town next to the leg on the grain elevator. Our magnificent tower holds what I'm claiming to be the tallest TV antenna in town. We soon learned that there was a reason behind it because of the absolute lack of any sort of reception or contact with the outside world while standing inside the house. With a little ingenuity, Tim was able to rig up the antenna to our 13-inch TV so the guys could at least watch the Nebraska bowl game while working yesterday. Owning a home together is a wonderful feeling, albeit rather scary for us as we are undertaking our first home improvement projects as husband and wife. We did agree to close despite the water damage on the condition that the sellers would have to keep some money in escrow until the insurance had settled. At least we are sharing the risk of loss with everything that needs to be done. This past weekend was designated in my mind as "moving weekend." Essentially, we would get everything prepared to move into our basement. I have been dodging packed boxes at my home in Wayne for nearly a month and a half, so I was ready to get things loaded up and moved out! Friday, part of Saturday and most of Sunday were spent scrubbing, cleaning, and removing damaged ceiling tiles. We also met with a few contractors to discuss some needs with the electrical, plumbing, etc. The water damage that the sellers experienced prior to closing quickly began adding up into some additional projects that are somewhat related, but not entirely. We figured so long as the main floor was in disarray, we might as well take on a couple of other needed improvements. So, we are considering new windows to replace those that are leaking air and water as well as a kitchen remodel. I'm not sure if this is what we signed up for as newlyweds, but we are going to test the marriage vows out right away! I mentioned earlier that this weekend was my proclaimed "moving weekend." Not everybody else was on the same page. It was actually "moving-tear-out-a-kitchen-deal-with-leaky-pipes-remove-hideous-wall-paneling-knock-out-damaged-drywall-troubleshoot-internet-problems-scrub-the-basement-from-top-to-bottom weekend." We even squeezed in a New Year and helped my family sort and ship hogs in between. Needless to say, we were both ready to go back to work this morning to regroup and reenergize. We certainly made progress, and at least we got a bed moved to sleep in last night because we were exhausted! On to this week and the many new things that lie before us. So far this morning, I have spoken to the cable/internet company, an electrician, a new cell phone provider, the appliance store, the window contractor, and the post office. Moving is tough! I can empathize with all of you who have been through this before. It is all worth it in the long run, though. Just waking up next to my husband this morning in "OUR" home was all I needed to remember the good things about my life and my work. Welcome home!